The Alupilot 17 M is based on an existing design which has been in service in Norway since 1996. The 16.8 x 5.2 meter hull is proven as a reliable heavy-weather boat and has been retained unchanged but the detailed engineering has been upgraded to the highest current standards. 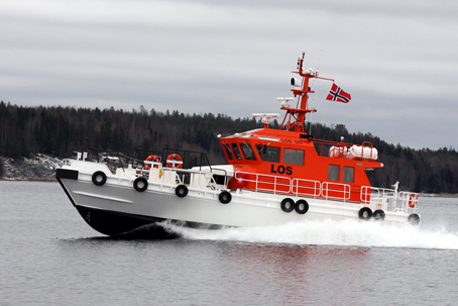 The boat is built in all welded aluminium construction according to requirements from the customer. The deckhouse could be fitted with a Pilot / Co-Pilot conning arrangement, toilet, pantry and seating for up to 8 Pilots. The noise level inside is extremely low, reaching only 61 db (A) at full speed. The westcoast of Norway is an extremely weather-hard area and calls for heavy-duty fendering. The AP 17 M has been fitted with the bolted truck-tyre system used on all DOCKSTA Pilot Boats delivered during the last 15 years. The system gives very good protection for the boat and low maintenance cost. In addition to the normal safety equipment, AP 17 M is also fitted with a comprehensive heating system to keep decks, boarding platforms and hand rails free from ice in below zero conditions.